Provide a larger tank if you are housing several hermit crabs. Several climbing or hiding areas should also be provided if you will be keeping several crabs of different sizes as bigger hermit crabs may bully their smaller housemates. Rinse out the hermit crab's food and water dish each day before providing it with fresh water and food. 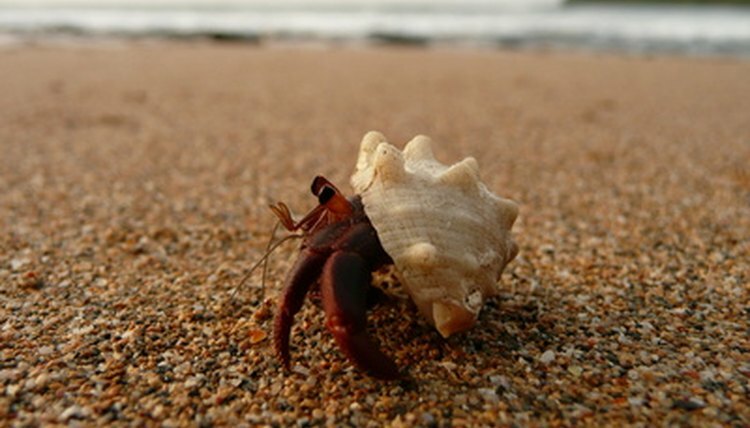 A hermit crab can be found on a rocky beach or near a tide pool. These intelligent animals can live anywhere from 15-50 years and can grow as large as a baseball. The name “hermit” crab is misleading because these arthropods enjoy the company of other crabs and will thrive if kept in pairs or multiples. The most effective way to keep a hermit crab found on the beach alive is to provide it with an ideal environment. Place the hermit crab into a 10 gallon tank. This will large enough for a younger crab, although a larger tank will be required as the crab grows. Fill the bottom of the tank with two to three inches of coconut fibers or sterilized sand, both of which can be found at a pet store. Maintain a constant temperature inside of the tank by proving the hermit crab with a heat source, such as a low wattage light bulb or a heat mat, which can be purchased at a pet store. The temperature in the tank should be maintained at a constant temperature between 70-80 degrees Fahrenheit. Provide the crab with fresh, non-chlorinated water and food daily. These should be kept in shallow bowls that the crab can easily climb in and out of. Hermit crab pellets will provide the pet with all of the minerals and vitamins it requires. It is especially important to make sure that the crab water bowl is not too deep, as the small arthropod could drown if it becomes trapped. Place a shallow, sturdy container filled with salt water in the tank. This will be used by the hermit crab for bathing and should be changed daily. Place two to three shells inside of the tank of varying sizes that are larger than the one the hermit crab is currently occupying. When the hermit crab outgrows its current shell it will require a larger portable home. Giving the hermit crab several options will allow it to choose the perfect fit, just as it would in the wild. Place a piece of drift wood, a store bought hermit hut or a clay pot into the tank. These will provide play and hiding spots for the crab.